Although Mark Twain was never specific regarding the year his famous novel The Adventures of Tom Sawyer took place, it is widely accepted that Sam Clemens's boyhood home of Hannibal, Missouri provided the inspiration for the locale. A bit of historical detective work regarding phases of the moon during the months of June indicates that on June 17, 1845, the moon would have been nearing full moon phase around midnight in Hannibal. To further firm up the date of June 17, 1845, a check of the calendar for 1845 indicates that June 17 was indeed a Tuesday--falling in line with Mark Twain's text from Chapter 6 indicating Tom and Huck planned to visit the cemetery at midnight on a Monday night. Did Mark Twain, in fact, consult the almanac for the year 1845 when he wrote The Adventures of Tom Sawyer? The answer remains to be discovered. John C. Winston Co. 1931. 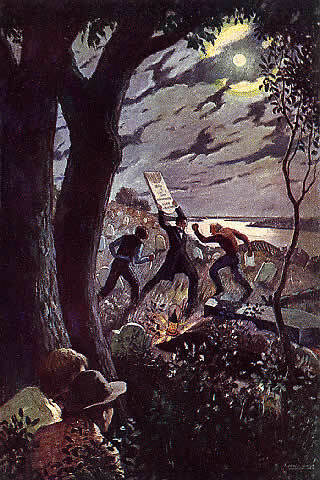 With the assumption in mind that Tom Sawyer was set in the year 1845, when Sam Clemens was ten years old, finding cemeteries which may have provided the inspiration for Tom Sawyer's midnight escapades becomes clearer. Popular tradition in Hannibal, Missouri today contends that the "Old Baptist Cemetery" was the model for the dilapadated graveyard Mark Twain described in The Adventures of Tom Sawyer. However, the more logical cemetery that Mark Twain recalled was located southeast of the location of Old Baptist. Current map of downtown Hannibal, MO showing location of Old Baptist and location where an "Old" Cemetery was once located. 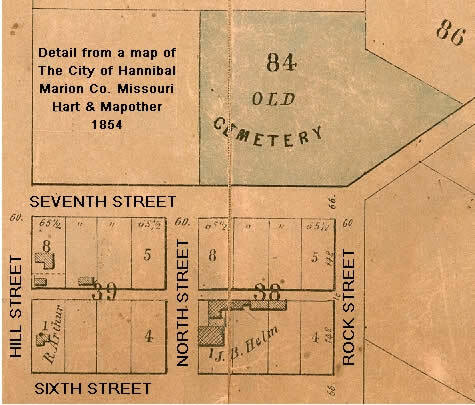 In Hart and Mapother's 1854 map of Hannibal the "OLD CEMETERY" is shown just west of Seventh Street between Rock and North Streets. The contemporary map of Hannibal shows the location of the long gone old cemetery in relation to Old Baptist which is still maintained. During the 1840s and '50s "Old Baptist" would have been the new cemetery, probably well maintained and the place where the best citizens like Mark Twain's father John Marshall Clemens were interred in style. Reprobates like the fictional "Hoss" Williams in Tom Sawyer would much more likely to have been buried in the older cemetery which was probably neglected and would have looked more like the decaying place Clemens described. The "OLD CEMETERY" was totally abandoned after the Civil War and became part of Hannibal's downtown residential neighborhoods. All of the mortal remains were supposed to have been unearthed from the old hallowed ground but subsequent owners and tenants of the property continued to turn up fragments of human bones on into the 20th century. Efforts to revitalize "Old Baptist" cemetery were addressed in a newspaper article by Edward Husar in the Quincy Herald Whig on April 7, 2002. The following article is reprinted with permission. HANNIBAL, Mo. - Hannibal's old Baptist Cemetery is steeped in lore and legend, yet it's overlooked by many Hannibal residents and tourists. The cemetery stands sheltered from view atop a downtown bluff near Summer and Section Streets, less than 3/4 of a mile from Mark Twain's boyhood home. The cemetery reportedly served as a burial grounds as far back as the 1830s, though it wasn't officially platted until 1844 when Twain was 9 years old and in the midst of his adventuresome boyhood years. Legend has it that the hilltop cemetery may have been the inspiration for one of the most compelling scenes in "The Adventures of Tom Sawyer," Twain's landmark fictional work based, in part, on his boyhood experiences. In addition, some of Hannibal's most prominent early residents were buried in this cemetery - not far from the graves of slaves and former slaves, including a black contingent that served in the Civil War. Despite its claims to fame and picturesque setting, the old Baptist Cemetery has fallen into a state of disrepair. Portions of the cemetery are overgrown in weeds and fallen trees. Many of the weather-worn tombstones have toppled over from the onslaught of time, erosion or vandalism. Most of the records associated with the cemetery have been lost, leaving many grave sites unmarked, their contents unknown. Several local groups, however, are launching an effort to bring the cemetery back into prominence. Among them are the Friends of Historic Hannibal and the Marion County Historical Society. Those groups have "adopted" the cemetery as the focus of a long-term cleanup project. Frank Salter, a longtime member of both organizations, said the cleanup campaign is still in its infancy. He said volunteers are being recruited to help. Salter said the cleanup and restoration effort will require a massive amount of time and effort. "It's going to be a many-year project - even with a group of people working several Saturdays a summer," he said. Weeds and trees will have to be cut back, and hundreds of tombstones will have to be cleaned, repaired and placed in an upright position. Many of the stones are now practically unreadable, but an effort will be made to retrieve some of the vanishing information before it is lost forever. "Imagine a cemetery bigger than a football field with a lot of stones - none of which are perfect. They're all tilted or broken or fallen over, and there are hundreds and hundreds of them," Salter said. "Our hope is to fix what we can on a slow basis and try to keep it in the forefront of people's thoughts." Salter said the aim is to preserve what's left of the cemetery before any more is lost to obscurity. "Just raising historical consciousness is kind of the grand goal," he said. Candace Klemann of Quincy, Ill., one of the organizers of the cleanup campaign, said volunteers of all ages and from all walks of life are being sought to help with the work. "What we want to do is get lots of groups involved," she said. "Getting the site cleaned and cleared is our first goal." Salter said the city of Hannibal, which has owned the cemetery since 1965, has promised to send work crews to the cemetery for several days of weed cutting. He said city crews have already put in one day of work this year. The city also has the lawn mowed on a regular basis. Salter and Klemann believe the cemetery could become one of Hannibal's most treasured sites because of its alleged ties to Mark Twain, who was known as Samuel Clemens while a boy growing up in Hannibal. One of the favorite local legends is that the cemetery inspired Twain's description of a cemetery murder scene in "Tom Sawyer." The scene involved Tom and his companion, Huckleberry Finn. They were hiding behind an elm tree when they saw Injun Joe stab Doc Robinson, rob the body and place the "fatal knife" in the hand of Muff Potter, who was erroneously accused of the crime. Paul Fix of Hannibal, a local Boy Scout, erected an elaborate sign in the cemetery in 2000 as part of his Eagle Scout project. The signs describes the "Tom Sawyer" legend and quotes the following passage from the book: "It was a graveyard of the old-fashion Western kind. It was on a hill, about a mile and a half from the village." Salter said local historians are "trying to find some evidence that this is the cemetery he (Twain) had in mind when he wrote about Doc Robinson and Injun Joe and the murder at the cemetery." But no proof exists at this point. In their book, "Hannibal Yesterdays," local historians J. Hurley and Roberta Hagood wrote a chapter about the old Baptist Cemetery. The Hagoods noted that a large number of prominent Hannibal residents were buried at the Baptist cemetery. However, once all the burial plots there were filled and the cemetery's appearance started deteriorating, many families moved the bodies of loved ones to the newer Mt. Olivet Cemetery in the latter 1800s. Playing into this was a desire to have all departed members of the same family buried at one location. The Hagoods wrote: "One of the promoters of Mt. Olivet persuaded Mark Twain to let him arrange to move his father, Judge John M. Clemens, and his brother, Henry Clemens, from the Old Baptist Cemetery to Mt. Olivet" where Twain's mother and some other family members are buried. Also buried at the old Baptist Cemetery were several relatives - and a slave, Agness Flautleroy - who belonged to the family of Laura Hawkins, the girl who served as the inspiration for the Becky Thatcher character in several of Twain's works. Laura Hawkins, however, is buried elsewhere. Other notable burials at the cemetery include Jenny Hatch, the wife of William M. Hatch, whose son, William Henry Hatch, became a well-known Congressman; John and Emily Garth, grandparents of John Garth, a prominent businessman and benefactor who built the Garth Mansion; and Celia Stone, the first wife of the Rev. Barton Stone, one of the founders of the Disciples of Christ (Christian) Church. Also buried there is Col. Stephen Lee, who, according to the Hagoods, built and operated a large distillery at nearby Scipio in Hannibal's early days. Anna Owens, who lives next door to the cemetery, said she did some research that shows Lee - who died in 1861 at age 74 - had some family connections to Gen. Robert E. Lee of the Civil War. Owens said she and her family attempted to do some maintenance at the cemetery over the years, but the job became too big for them. So she's happy to see some local volunteers stepping forward to pitch in. "I'm glad it's being cleaned up," she said. Anyone wishing to help with the project can call Salter at (573) 221-0313.